We’ve lost something special, haven’t we? Something we all witnessed being slowly built by Manuel Pellegrini. That spirit of togetherness, genuine team spirit that propelled West Ham into the top half of the Premier League, has been shattered. In less than a fortnight, that collective spirit the manager had built, disintegrated before our eyes at Bournemouth, Kingston and Wolverhampton. It was all going so well. But the fragility that is team sport, that belief in the common good, the shared ambitions, just fell apart. One man’s selfishness, one man putting himself above the team ethos, and we have witnessed three torrid games in just 11 days, all dreadful defeats that have derailed our season. It may be repairable, you never know, but at the moment it feels like we have really lost something important. And if anyone had any doubts about how the squad feel about Marko Arnautovic, you only have to listen to the no-nonsense approach of Pablo Zabaleta, the occasional words of annoyance from the manager, and similar sighs of disquiet from elsewhere. Of course the party line is that the players understand Marko’s position and his desire to seriously increase his wages to give his family a better life. We would all understand that, if someone had offered me a chance to double or treble my wages, I would have taken it. But football is different in some ways. Transfer fees and contracts for a start. And there are ways to go about it. Marko chose to wave goodbye to the fans before a deal had even been discussed. He and his brother were determined to push through the move to China, regardless of the three plus years left on his contract. Then he was told he would not be sold, certainly not for the €35million offer.. That’s when the toys came out of the pram, we are told there was uproar at Rush Green. That can only seriously damage team harmony. We had just beaten Arsenal with the best performance under Pellegrini, we were anticipating a Cup run, and on the verge of seventh spot, a position that will gain European football as long as the FA Cup finalists are both from the top four Champions League qualification positions. The same applies to the League Cup, as long as finalists Chelsea and Manchester City stay in the top four. That would mean sixth and seventh place getting a European slot. Pellegrini admits the situation has been hard to handle, his squad have been seriously disrupted. He didn’t play Marko at Bournemouth because the poor lad’s head wasn’t right. I use the word poor advisedly. He left him out of the FA Cup disaster at Wimbledon because he was not impressed with the quality of his training. He is believed to have assessed the situation, sorted a replacement, and given the green light for the board to sell the Austrian. Then the wheels started to come off. Pablo says that the problems around the transfer window left “a little bit of a bad atmosphere”. You sense he was choosing his words carefully. He talked of how December had produced a good run, with the everybody "playing as a team". January was very different, "tough on and off the field". There are some who still defend Marko and insist you can’t blame him for these last three disastrous defeats. Watching the defending of set-pieces at Wolves, the lack of fight at Wimbledon and the general apathy at Bournemouth, no it wasn’t all down to Marko. Even if it is still all about him. But he has to shoulder the blame. He was the catalyst for all the sudden disunity. You see, players find it hard to accept one player thinking he is above the rest or that he is suddenly pandered to and treated as something special. You can bet that after Pellegrini said that the player could be sold, only to find that he had been offered a contract extension, plus incentives to score goals and not to upset everyone by being a pain in the backside, the atmosphere was certainly bad. I would have thought that trying hard to score goals and not to be a pest at the training ground was a fair description of what generally should be expected. Without incentives. There are always more questions than answers at West Ham. Firstly, was the manager in agreement to give Marko a contract extension, did he sanction it? If not, then who decided to grovel before Marko and his brother and throw more money at a player already earning £105,000 a week? You can only assume that the inclusion of a £45million release clause was crucial for the board, to protect their interests when the next transfer window comes around in the summer. Pellegrini has generally protected Marko, said he understood his problem and wouldn’t slag him off in public. That’s the commendable, professional approach. But you could tell he didn’t like the situation and has talked carefully about the disruption behind the scenes seriously damaging the build-up to the Cup defeat at Kingsmeadow. The Instagram stuff was bad enough. Whether it was written by him, his advisors or someone at the club we will never know. I have my guess. But in all those words about loving London, us, the ground, his mates down the bookies, he never once said Sorry. Sorry for the unrest, the distress amongst fans, the loss of something they believed in. Next came the club website interview, and not the word "sorry" there either. Now I would guess that interview happened sometime on Friday, maybe Saturday morning. But either way, the players would have known about its content and the tarted-up contract details. Bet that did a lot for team morale as they headed off to face Wally Downes’ reincarnation of the Crazy Gang. The club’s media department decided to sit on that interview and video, and someone reckoned it would be a good idea to release it after the Cup tie. Did they do that in the arrogant belief that we would win the tie and attempt at a charm offensive on Marko’s behalf would have been more acceptable to a cynical fan base? Was it on a timed release on the website or did some operative still decide in was right to put it out there in the wake of one of the worst Cup defeats this club has ever suffered? And there have been a few. Forty actually against teams then below us in the league structure since 1961. Some of us have seen a fair amount of those. Anyway, the button was pressed and not surprisingly the furious fan base went into meltdown. Hardly surprising. Does anyone in our glorious media version of Pravda actually think before they act? The fact that the story was up and running having been leaked to a favoured on-line newspaper at 5.00pm hardly covers anyone in much glory. So there you have it. Players upset at what has been going on for some weeks, but only visible to us for a fortnight. With Pellegrini walking into a press conference after the Wimbledon disaster, already angry, and then finding he was facing questions about the absent Marko’s contentious contract. Did our manager even know the story was going to be out on the website? Pellegrini’s attitude to the whole thing was considered in an interesting twitter feed from Jacob Steinberg, the excellent Guardian and former KUMB writer, whose coverage of West Ham is as good as it gets. He talked of whether our manager, having been in charge of greater stars, greater talent and greater egos at Real Madrid and Manchester City, really felt that mad Marko deserved that sort of pacifying treatment. This was no Ronaldo or Aguero, both of whom would justify a level of superstar tolerance in keeping with their achievements on the pitch. It’s not always palatable, but of course it happens and everyone grudgingly goes along with it. 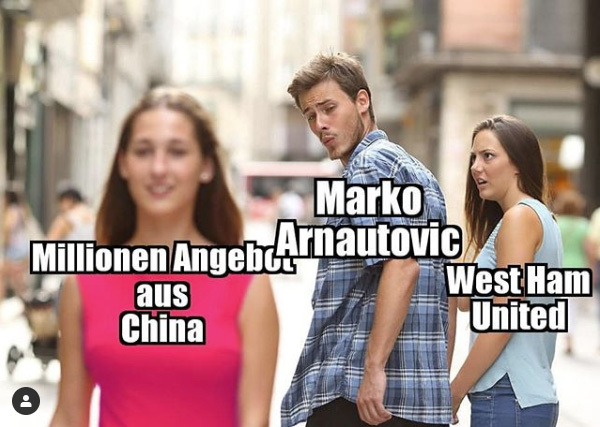 But Marko? One half of a good season after he was switched to a main striking role by an increasingly desperate David Moyes. One quarter of a decent next season with us. Before that he had been an arrogant, self important, sometimes very ordinary player at Stoke, Bremen, Twente and Inter Milan. I would love to hear Pellegrini’s real thoughts on the matter. So now we have a completely different scenario to the last time we were at the London Stadium. That was the victory over Arsenal, surely a springboard to a genuine push for Europe. Since then three disasters, the season in ruins and a team already stretched to the limits by the horrific, but regular, injury list. And it’s Liverpool next and soon Manchester City away.